From The Washington Post. April 27, 2005. 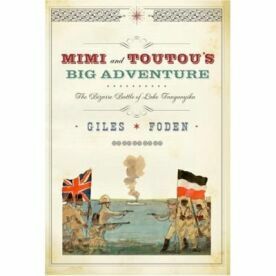 Giles Foden's enjoyable book comes with the movie-style tag line: "The incredible true story that inspired the classic film The African Queen." Strictly speaking this is true. C.S. Forester had a vague idea of the events Foden describes in this book when he came, in 1935, to write the novel on which the film was based, and the director John Huston may have known something of them when in 1951 he adapted James Agee's screenplay. But neither novel nor movie bears more than a passing resemblance to the reality. Anyone who picks up this book with the idea that he is about to be introduced to the real-life equivalents of the characters played by Humphrey Bogart and Katharine Hepburn is bound for disappointment. Yet the real story is in some ways more fascinating than the movie. There, you may remember, Bogart's drunken Charlie Allnut teams up with Hepburn's Rose Sayer, sister of a British missionary in what was German East Africa (now Tanzania) at the outbreak of World War I. When her brother is killed, Rose vows vengeance on the Germans and browbeats the essentially pacific Charlie into taking his ancient boat, the African Queen, on an impossible journey downriver to attack a German gunboat, the Königin Luise (which Charlie called the Louisa), plying the fictional Lake Wittelsbach. On the way, the two fall in love. In real life there was no love interest, but the hero, Geoffrey Spicer-Simson, "the oldest lieutenant commander in the Royal Navy," was at least as engaging a character as Charlie, and his coming to any military engagement with the Germans was if anything even more unbelievable. It required him to journey at the head of a ragtag team of 28 adventurers and military misfits and in charge of two 40-foot mahogany motor launches he named HMS Mimi and Toutou from London to Cape Town and then overland for more than 2,000 miles, dragging the boats by rail, oxen, traction engine and muscle power through trackless jungles and over the 6,000-foot-high Mitumba Mountains on the way to launching them on Lake Tanganyika. That anyone should have made such a journey was remarkable, but that Spicer did so was astonishing. A braggart who had long aspired to heroism but seemed the least likely of men ever to achieve it, he was arrogant and overbearing, and he wore a skirt. For much of their journey, his men held him in contempt. Yet not only did he bring them safely to the lake, he also took Mimi and Toutou into action against not one but two larger German gunboats, the Kingani and the Hedwig von Wissmann, capturing one and sinking the other. Though he funked a third engagement with the much larger Graf von Goetzen, that ship had to be scuttled by her captain. As a result of the powerful magic or juju manifested in his naval triumphs, Spicer found himself the object of worship among the local tribesmen who made perfect effigies of him, binoculars, skirt and all. Though Foden's is an enjoyable story insofar as it is told straightforwardly, he sometimes reaches after effect. At one point he notes that along the "paradise" of the Lualaba River, the men of Spicer’s expedition fired their rifles at some of the animals on the bank and "Again Conrad's words come to mind: ‘In the empty immensity of earth, sky, and water . . . incomprehensible, firing into a continent’." Well, I don't think they'd come to most people's minds, at least not if they weren't already determined to see the story as paradigmatic of the colonial experience. Thus, too, in his final chapter, Foden goes in search of the remains of the Mimi or Toutou. Finding only some villagers who remember seeing them, he writes that to them "It was just the boat of some white men who had fought near here, long ago." Of course, there are probably just as few Englishmen or Germans or Belgians who would take any interest in this obscure colonial history if not for the unspoken reality behind Foden's elegiac tone — which is that his book would most likely never have been written if it had not been distantly related to a classic Hollywood movie and to the now legendary movie stars associated with it. It seems we have our own ideas about juju and who should be worshiped on its account.